For frequent travellers in the United States, we at Earthabitats have created the perfect product to journal your cross-country travels, the Scratch Off USA Map! Scratch off the states you have been to reveal the beautifully colored landscape underneath. Perfect for keeping track of how much of the country you have actually seen. Make it your goal to scratch off every part of the country! Feel the satisfaction of scratching off yet another state and discovering the landmarks in it. Hang the Earthabitats Scratch Off USA Map on your wall and you've got yourself a classy wall decoration, plus an awesome conversation starter for your guests. We have also designed companion accessories to help you craft your personalized map. The guitar pick scratcher is a much better scratching tool than coins, giving you the ultimate scratching comfort and fine precision to cleanly scratch borders. The memory stickers depict travel activities, memories and personal history. You're your story on your map! The eraser helps you erase scratching smudges and maintain your map in tip top condition. The magnifier enlarges small details for the visually challenged. 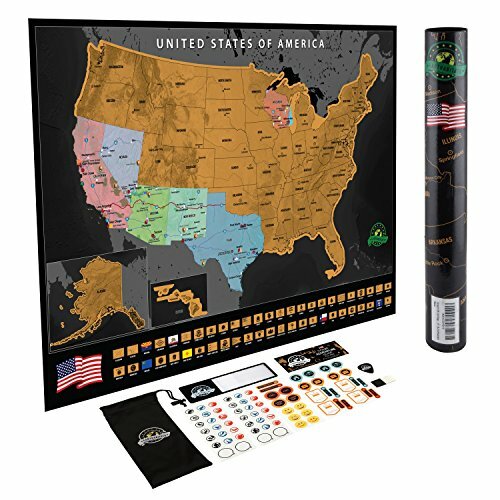 When you need a travel gift for that special traveller in your life, the Earthabitats Scratch Off USA Map is a brilliant choice. Click "Add to Cart" above and scratch America today! SCRATCH OFF USA MAP. Track your travels, scratch off where you have been in the USA to reveal the beautifully colored states! Our map features rich cartographic details of the terrain, capitals, major cities and state flags. Printed on thick 220GSM paper and protected with laminated finishing, our map arrives without scratches and ensures quality. PERFECT GIFT FOR TRAVELERS. Our map comes in gift ready packaging to delight the travel enthusiasts in your life. A perfect conversation starter, give them a special moment scratching the map with loved ones while sharing stories and dreaming new adventures together! US STATES OUTLINED. AMERICA THE BEAUTIFUL. Discover the treasures of the country, from sea to shining sea! National parks, major landmarks, highways and Route 66. Have you seen them all? SCRATCH OFF MAP. We bundled in companion accessories to complete your scratching experience! A comfortable scratching tool, memory stickers to mark your travel memories, eraser to clean scratch smudges and magnifying strip for the visually challenged. Frame the map and impress your guest with this striking piece! LIFETIME MONEY BACK GUARANTEE. If you haven't had a 5-star experience with us or your product, we will do whatever we can to fix that! All our products are tested and loved by us, we love our customers and your 100% satisfaction is our top priority. If you have any questions about this product by Earthabitats, contact us by completing and submitting the form below. If you are looking for a specif part number, please include it with your message. Stone & Beam Modern Black and White Palm Branches Photo, Black Frame, 18" x 22"